After seeing the final Hunger Games movie with Jeremy the last week of December, I decided that I’m really, quite done with apocalyptic stories. I need a breather from end of the world stuff. Like any trend, it will eventually wane and I decided to get a head start. Then I picked up Station Eleven, and for a split second, I thought about swapping it for something else. It’s been on my TBR (To Be Read) list for a while, collecting a little dust on my shelf, so I thought, okay – one more go around with our existence on the fringe. 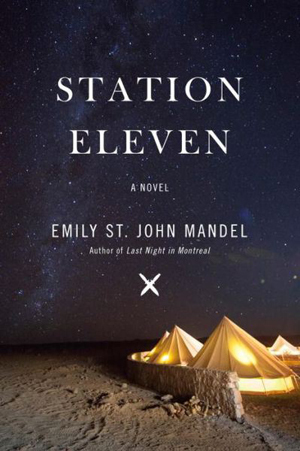 I already told you my five favorite books from 2015, and that list hasn’t changed, but if I had written a top ten list, I would’ve put Station Eleven on it. The story begins in present day Toronto with the unfortunate death of an actor – Arthur Leander – while he’s living out his last King Lear performance. He’s tended to, unsuccessfully, by what become pivotal characters, and immediately after the curtain closes we learn that an epidemic has turned into a pandemic. The Georgia Flu is wiping out the world. Within weeks of Arthur’s unrelated death, 99 percent of the population will be dead. Fast forward 20 years and the world has reverted to a place with no electricity, no gasoline, no transportation, no internet, no phones or TVs or email. There are camps of people living in old gas stations and airports and emerging cult religions. There are people who remember how life used to be before the flu and young people born after the flu who don’t know the hidden power of a light switch. There is also the Traveling Symphony, a group of musicians and actors committed to taking music and theater to those who enjoy it. In that group is Kirsten, who was eight years old and backstage when Arthur died and carries around a remnant from the old world – a futuristic comic book set in outer space called Station Eleven. Here’s what the book has going for it: The characters are acutely defined and enjoyable. I cared where they went, what choices they made, and was curious to know who’d survive and who wouldn’t. The plot, too, was a streamlined sequence of events, mostly out of order, that linked various camps of people together in surprising ways. Finally, author Emily St. John Mandel created a stark and believable future without rewriting the basic fabric of our humanity. I really appreciated that. If I had to give you a negative, then I’ll reiterate my original complaint about the current over-saturation of apocalyptic entertainment we have on our bookshelves and in our movie theaters. It’s everywhere, exhaustively, and though people are interpreting the end of times differently (zombies or no zombies? ), Emily St. John Mandel is handling the issue with her feet firmly planted in reality. She wrote a book that makes you think, “Oh yeah. This could totally happen.” And that’s what makes it so good. Oh, 2016. I’m already tired.